We moved into our dream property just after Christmas in 2011. We knew it would be a lot of work, partly because the place was a little rundown and had never been used productively, but mostly because our aim was, and still is, quite ambitious. Linhda suggested that we not get any stock animals for a year. She quite sensibly suggested that we spend some time getting the infrastructure sorted out, do some research, and find out what we should raise and how we should raise it. My response was to agree with her plan and the logic behind it. The result was that we had our first stock animals (sheep and meat chooks) a full two weeks before we moved in. Running-before-you’ve-learned-to-walk has been a common theme since. We’ve now been here just over a year. It was only recently that I realised just how much progress we’ve made. Living it and working on it constantly for that length of time means that you lose some perspective. Over Christmas we were forced to slow down due to the heat, and only then did we take a breath and really look at how far we’ve come. That was partly the driver for this blog, as I’m determined to preserve these details. It’s not just about the end-game – how we got there is just as important. My five-year plan had been to work up to raising pigs and having a milk animal. Right now, only a year on, we have pigs that are only a few months from breeding, and we have a milk goat that may or may not be pregnant and so that may or may not actually be a “milk” goat. We’ve raised and had slaughtered six stock animals (sheep and goats), and over 50 poultry. We have around 400 square metres of veggie patch, and somewhere between 50 and 60 fruit-bearing plants. 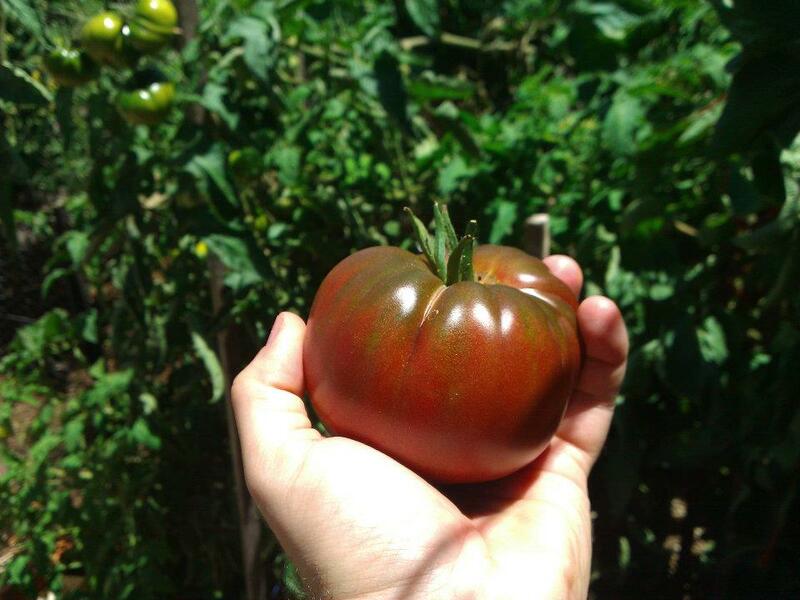 Black Russian tomato – our favourite!